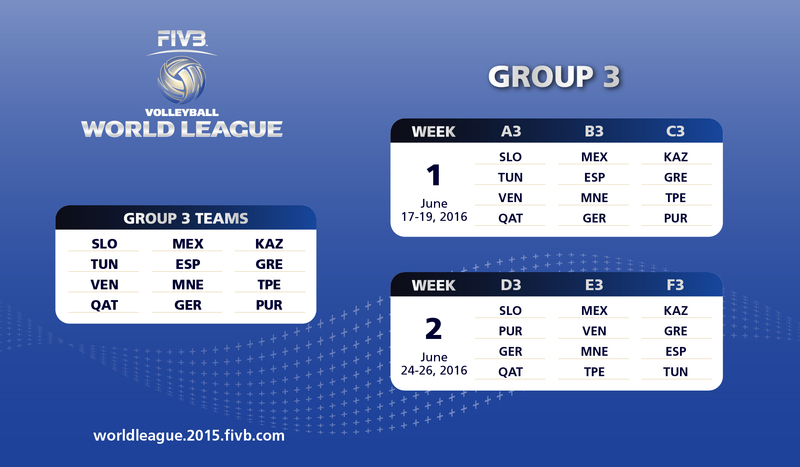 Lausanne, Switzerland, October 29, 2015 - The FIVB is pleased to announce that twelve teams will compete in FIVB Volleyball World League Group 3 in 2016 with Chinese Taipei, Germany, Slovenia and Qatar joining Greece, Kazakhstan, Mexico, Montenegro, Puerto Rico, Spain, Tunisia, and Venezuela. As a result, the World League will feature a record 36 teams for the first time in the history of the competition. The pool round matches in Group 3 will take place over two weekends: on June 17-19 and June 24-26. The twelve teams in the group will play in pools of four teams each. Group 1 includes the top 12 teams in the 2015 World League: France (winners), Serbia (runners-up), USA (3rd), Poland, Brazil, Italy, Iran, Australia , Russia, Bulgaria, Argentina, Belgium. The eight teams in Group 1 in 2015 (Australia, Brazil, Iran, Italy, Poland, Russia, Serbia and USA) have been joined by wild cards Argentina, Belgium, Bulgaria and 2015 winners France. 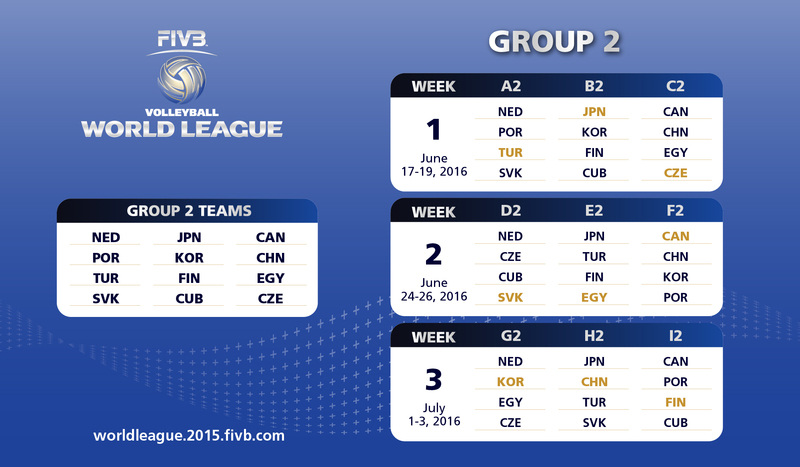 Group 2 is composed of the 12 teams ranked 13th to 24th in the 2015 World League. They are: Japan, the Netherlands, Canada, Finland, the Czech Republic, Cuba, Korea, Portugal, Egypt, Turkey, Slovakia and China. The eight teams competing in Group 2 in 2015 (Cuba, Canada, Japan, Korea, Czech Republic, Portugal, Finland, Netherlands) have been joined by wild cards China, Turkey, Slovakia and Egypt, who competed in Group 3 in 2015. The 2016 edition of the FIVB Volleyball World League will take place in the immediate run-up to the Rio 2016 Olympic Games. The Group 1 and 2 preliminary rounds are scheduled from June 17 through to July 3, while Group 3 will be played from June 17 to June 26. The Group 3 Finals will follow from July 1-3. The competition will end with the Group 2 Finals from July 9-10 and Group 1 Finals from July 13-17.